As a small token of thanks, we are offering these free resources for our newsletter subscribers. We hope to continue to add more helpful content and will keep our readers updated on additions through our newsletter. If you have not yet subscribed to our newsletter, you can sign up here. Our ebook, 5 Photographs: From Field to Finished, is available to our newsletter subscribers for free. In 5 Photographs we walk through all of our steps, from arriving at a location to processing the final photographs, and cover our full workflow including creative and technical notes for five of our favorite photos. You can download your copy of the ebook here. 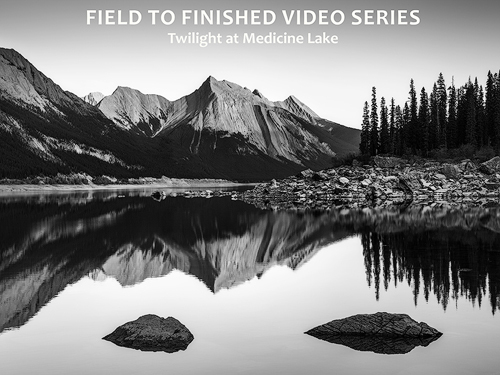 For Field to Finished #6, Sarah shares everything that went into creating this photo, "Twilight at Medicine Lake" from Jasper National Park in the Canadian Rockies. This video is 32 minutes long and covers field techniques, composition, camera settings, and an overview of the processing steps Sarah took to finish the photograph. Quick access to detailed weather forecasts is a very useful planning tool when we are out on photography trips. Along with a few weather apps, we use NOAA's (National Oceanic and Atmospheric Administration) weather resources to help make decisions and anticipate conditions. To make accessing this information easier, we have pulled together a "Photo Locations" page on our website with quick links to NOAA's hourly weather graphs and other helpful information for places we frequently visit. You are welcome to bookmark and use this page if you think it will be a helpful resource for you, as well. The page is a work in progress, so if you see a mistake or think we should add another major location, please get in touch with your feedback.